Beer is more than beer—it’s an experience. 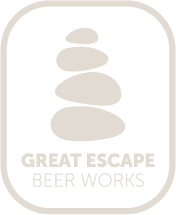 At Great Escape, our beer is inspired by an adventurous lifestyle for people who want to savor all life has to offer. We love to experiment and explore the limits of what’s possible in the brewing world, and we strive for excellence because we believe everything is more fun with good beer. When we tilt our handcrafted tap handles, your pint glass will slosh and swirl with porters, pale ales and pilsners inspired by Mother Nature’s beauty and diversity. As conservation-minded brewers, we cool our boiling wort with city water and then reuse the hot water in our liquor tank. We also give the spent grain to local farmers for feed. Cheers to environmental stewardship! We get it. Locals want locally brewed beer. They want beer that’s fit for the environment and the season—beer they can take on a hike, to the lake or to the backyard hammock. So we decided to open a brewery for our neighbors, friends and fellow beer lovers we have yet to meet. Our hope is that Great Escape is a place that’s familiar but never boring. A place to try something new or enjoy an old favorite. A place where people know your name but you always meet someone new. We want to take you on our adventure and join you on yours. Great Escape only serves the highest-quality beer. Our seasonal offerings keep things fresh and allow us to experiment with different flavors. Stop by our brewery and sample our newest varieties. Not sure what’s right for you? Ask our brewmaster, Jake, or one of our intrepid bartenders. They’re here to help you find your new favorite beer.